Every now and again a pokie developer will break their own mold and release a game that stands out in their catalogue. ReelNRG have done just that with their latest game, Dragon’s Castle. It is an action packed game that is loaded with features and adventure. 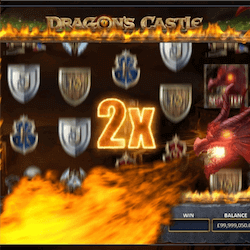 The aim of this slot is to travel to a dragon’s castle lair along with a wizard. You must attempt to avoid the dragon while plundering the castle of its rewards and riches. You need to search the castle carefully however as it is hiding a massive 200 000 jackpot prize. With an over 96% RTP the search won’t be too hard. Setting up your wagers is also simple with the standard 5×3 layout ReelNRG has used here and the 20 paylines there are available to activate with adjustable coins. You are also able to play Dragon’s Castle on a variety of platforms, from your desktop PC to your Smartphone thanks to its full HTML5 compatibility. What would be the point of calling a pokie Dragon’s Castle if there aren’t any dragons that show up? With the Dragon Multiplier feature, a red dragon will randomly appear to blast his flame across the reels, adding an up to 7x multiplier to any win that is formed afterwards. A Minimum multiplier of 2x will activate when this feature kicks in. In a similar way, the wizard can also affect the game play with his powerful magic. At Random the wizard can blast the reels, turning up to 10 symbols completely wild. A minimum of 3 symbols will get transformed by this random feature. To take part in the Free Spin bonus game in Dragon’s Castle, you need 3 or more of the dragon scatter symbols. These scatters will show up on reel 1, 3 and 5. They not only activate the bonus game but they will also pay you 2x your total staked wager when the feature activates. You can take 10 free spins at the same wager value that was active when the feature triggered. You will also get a higher chance of either the Wizard Wilds or the Dragon’s Multiplier feature kicking in. Dragon’s Castle is a great effort by ReelNRG and its well worth your time. Its great graphics and action packed game play serve the theme perfectly. If you are looking for excitement and rewards in your pokies, check this one out.